Are you aware that Google recently rolled out a new update called “Mobile-Friendly” update and it’s taking serious effects for the ranking of sites this 2018? Is your site mobile-optimized? The new update was developed to penalize pages that couldn’t be fully accessed on mobile phones and tablets. The rolled-out Mobile-Friendly update is popularly called “Mobilegeddon”. To get a first page rank in 2018, your site must be fully optimized for mobile phones and tablets. And in today’s ultimate guide, I’m going to show you details about mobile SEO and how you can get a first page rank this 2018 by optimizing your site for mobile devices. In this lesson, I’ll show you the fundamentals and teach you the strategies to optimizing your site for mobile phones and tablets. If you can’t be so sure as to whether your site is mobile-optimized or not, this lesson will give you an insight into that. The mobile optimization strategies and best practices will be discussed fully in this post. What Do You Understand By Mobile SEO? Mobile SEO is the act of optimizing your site for those who surf the net via tablets and smartphones. Mobile optimization means enabling search engine spiders to access your site data. What Is The Efficacy Of Mobile SEO? Literally, the number of mobile searches is increasing exponentially day by day. It’s found that over 60% of all searches made come from mobile devices. Google recently disclosed that the number of searches performed on mobile is 27.8 billion more than the number performed on desktop. Obviously, the future of SEO is mobile. And that’s literally why Google’s search algorithm is being overhauled to focus on mobile search. What Is Optimizing For “Mobile SEO” All About? In as much as over 94% of all searches performed on Google come from mobile, it’s worth optimizing your website for mobile SEO. Google’s search algorithm has been optimized for mobile users in order to maintain this level of dominance. The Mobile-Friendly update called “Mobilegeddon” was globally rolled out by Google on 21st April, 2015. The ranking of mobile-friendly web pages was maximally boosted on mobile search results. Sites that couldn’t be accessed on mobile (Sites that weren’t Mobile-Friendly) were severely penalized by this update. Google is now fully set to make its entire search algorithm “Mobile-First”. And your site must be Mobile-Friendly to avoid getting penalized. What Does Google’s Mobile-First Index Stand For? Google’s Mobile-First index simply ranked sites based on mobile versions regardless of whether the searches are being made on desktop or mobile. Prior to introducing the Mobile-Friendly update, Google was using two indexes; the mobile and desktop versions. At that time, Google would show search results from its mobile index when a search was made from a smartphone. Desktop results would also be shown if a search was made from a desktop. Henceforth, all search results are shown from the mobile index in Google whether you are searching from a mobile or desktop device. More emphasis will be made in the chapters below to ensure that you get your site Mobile-Optimized in earnest. What’s The Efficacy Of Getting Your Site Mobile-Optimized? Your rankings will drop from time to time as Google rolls out its search algorithm (HummingBird) based on its “Mobile-First” index if your site is not optimized for mobile searches. It loads data on all devices. To ensure that your site does not get penalized, the rest of this post is geared towards helping you get your site Mobile-Optimized. How Does Google Define “Mobile”? Most people categorize smartphones and tablets as mobile devices whereas in Google’s view, tablets are not mobile devices. According to Google, smartphones, iPhone and android devices are categorized as mobile devices. The most important thing is that you must optimize your site for mobile searches whether you are using mobile or desktop devices. To prosper with mobile SEO these days, your site needs to be Mobile-Friendly. If the full version of your desktop site cannot be viewed by a mobile visitor, there is a lot of trouble, be rest assured. In as much as implementing a Google ranked mobile website isn’t a big deal, it’s worth achieving. In respect of this, we shall be focusing attention on mobile SEO with a view to implementing a mobile site that gets ranked in Google. To configure your site for mobile, you have 3 different alternatives. With this configuration, you have a mobile version of your site (“M” version) and the desktop version (Main version). In this case, your site automatically detects the type of device any visitor is using at a particular time and then redirects such to a specific URL configured for that device. As the “M” versions of your sites would convey tons of search engine optimization issues, it wouldn’t be a recommended way to configure your site for mobile. When you configure the “M” version of your site, every post published on that site must have separate URLs which complicates certain issues in SEO. While trying to configure your site for mobile, the “M” configuration / Multiple URLs method is really undesirable for the reasons stated above and, therefore, not recommended for configuring your site for mobile. When posts are dynamically distributed, all of them are on the same URL though users are shown different CSS/HTML depending on their respective devices. If people try visiting your site https://onlinebusinesspublications.com/how-to-write-a-quality-blog-post from a desktop device, they’ll be served a desktop version of your site. If your site is visited from a mobile, then a mobile version of your site would be served. Thus, having all of your blog posts on the same URL is a more fantastic approach than using the “M” configuration / Multiple URLs though there are still certain SEO issues with this method. Dynamically distributing versions of your site to mobile users is better for SEO than the “M” configuration though this approach is still found with technical SEO issues. Using this alternative would call for creating multiple versions of each of your blog posts for all the latest devices. If this is not done, your page may not recognize the latest devices and that may constitute a more complicated SEO issue. 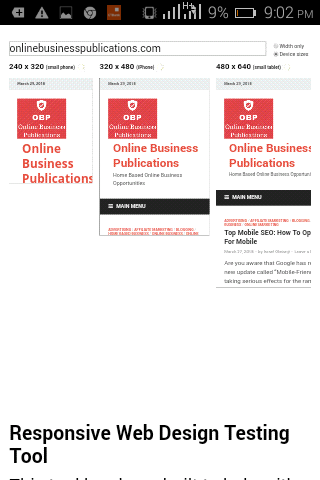 In spite of these, having all of your blog posts on the same ULR is not recommended for mobile optimization. Using the responsive designs will make your site’s content, images and layout responsive to the different individual visitors irrespective of the devices being used. With the responsive designs, there wouldn’t be needs for different CSS or multiple URLs for the different devices. The responsive design is superb and great for SEO as you have all of your blog posts on a single URL which facilitates getting backlinks and sharing posts. The most interesting part is that the responsive design is recommended by Google itself. It doesn’t call for redirects which slow down your site and cause a lot of technical issues in SEO. In as much as your site is optimized for mobile searches, you can get mobile SEO for your site easily. You’ll learn to ensure that your site is Mobile-Optimized and is considered Mobile-Friendly by Google and other major search engines. 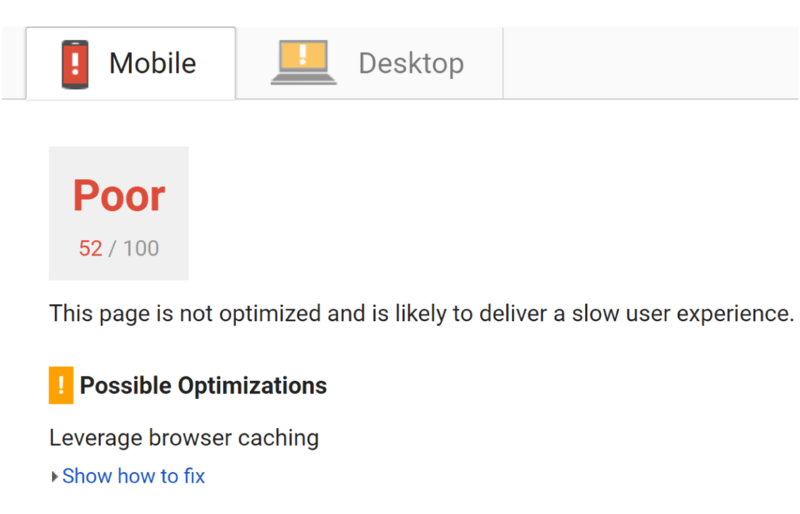 You have the Google’s mobile usability checking tool in the Google Search Console to see if your site is Mobile-Usable. 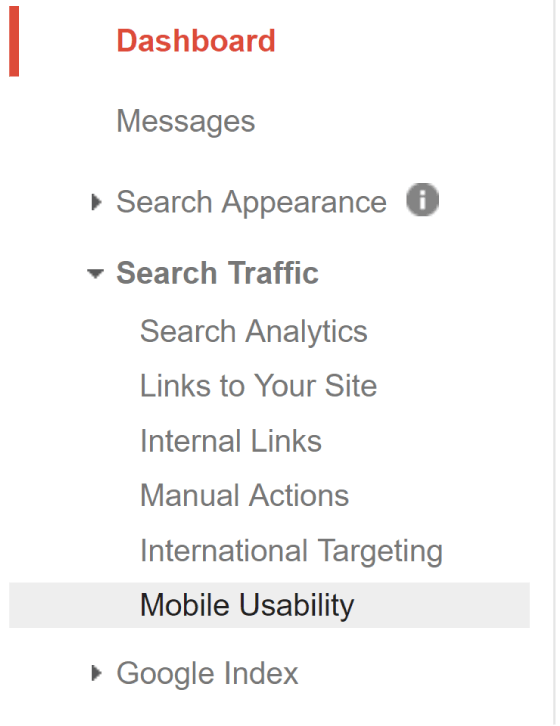 To start leveraging the Google’s mobile usability checking tool, log in your Google Search Console account, click on the Search Traffic button, then on “Mobile Usability”. And Google will notify you if mobile users have issues accessing your site. An alternative way to find out if your pages are Mobile-Friendly is to leverage the Google’s Mobile-Friendly test by popping your website URL into the tool. You will get a detailed report from Google stating whether or not your site is Mobile-Friendly. You will also be notified if the “”Mobile GoogleBot” is having issues loading all of the data on your page. With the introduction of the Google’s Mobile-First Index, there would be a technical issue if the mobile GoogleBot could not load all of the data on your page even if the desktop GoogleBot could do that. Do you care to check if GoogleBot is prevented access to the HTML/CSS or any other crucial part of your page? Be rest assured that GoogleBot won’t be able to say whether or not your site is Mobile-Optimized once it cannot be crawled. To find out using the Google Search Console whether or not GoogleBot is prevented access to the CSS/HTML of your website’s code, click on “Google Index” followed by “Blocked Resources”. The console will give you a clear report stating whether or not GoogleBot is prevented from accessing certain parts of your website. Alternatively, you can get to know if GoogleBot cannot access certain parts of your site using your “robots.txt” file. If nothing crucial is blocked on your site, there is no cause for alarm. You’re good to go. How Do Intrusive Popups Impact Your Search Rankings? It’s an indisputable fact that everybody dislikes popups. Without any doubt, Google too dislikes popups particularly for mobile internet users. 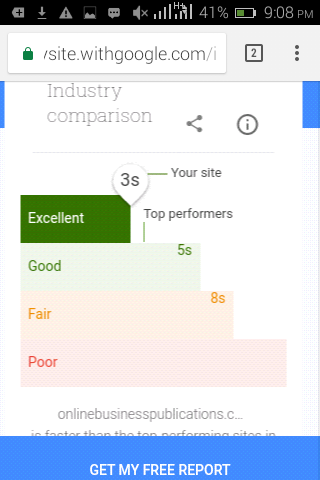 Google admires quality and helpful content but this attribute loses value once the content becomes hidden due to intrusive popups. If you use an intrusive popup on your site, it could negatively impact your overall search engine rankings. Seeing how your mobile site is viewed by Google is one major thing. Viewing your mobile site on all devices is awesome. Using this completely-free tool is highly recommended if your site has responsive designs. This tool will display how the pages on your site look on different devices such as small phones, iPhone, Smartphones, Tablets and many more. As most people prefer learning visually, yet it’s much more crucial and helpful to really see how Google views your pages. Spot-testing some crucial pages on your site using the Google Search Console’s “Fetch As Google” mobile feature is highly recommended. You implement this by popping an important URL from your website into the tool. From the drop-down menu, select “Mobile: Smartphone” as shown below. Doing these led to faster loading of data on mobile devices and speedily improved the mobile user-experience. In the Google’s Mobile-First index, your site’s mobile version becomes the main version. This implies that your content will not be crawled or indexed if hidden from mobile viewers. If any part of your content is hidden from the mobile internet users, such will be ignored by Google, thereby carrying less weight on it. Mobile users must view all of your page’s resources the same way desktop users do, otherwise, you will be penalized. Google’s RankBrain algorithm is basically designed to assess Google researchers’ interactions with your page. Once Google’s RankBrain detects that mobile users are frustrated by your site, you will be dumped like a useless piece of rag. To make sure that your mobile users have a better user-experience accessing your site, learn more below. Do you know at all if Google cares about your mobile site speed while ranking your site in search results? According to Google’s recommendation, your site must load up within 1-3 seconds when mobile users are accessing it. The first tool that will tell you how fast your site loads on mobile is the Google’s PageSpeed Insights. And it suggests what can be done to increase your site’s loading speed on mobile. An alternative PageSpeed checking tool highly recommended is the WebPageTest which loads sites on desktop browsers. Select “Mobile” from the menu and have your site loaded on a mobile browser. Do mobile users have to start scrolling to read your website content on mobile devices? Use 15-16 pixels font for your content. Do you have animations performed on your page? Do you have videos embedded within your content? For animations and embedded videos to work on mobile phones, content must be coded in HTML5, not in Flash. While implementing the mobile UX hacks, the following three tips might be helpful. If there are giant images on your site, it could frustrate Google’s mobile researchers in trying to access your site. A great way to implement the mobile UX hacks is to remove the giant header image or simply crop to a smaller size like this. Creating an uncluttered page will help a lot in making your site more usable for mobile users. 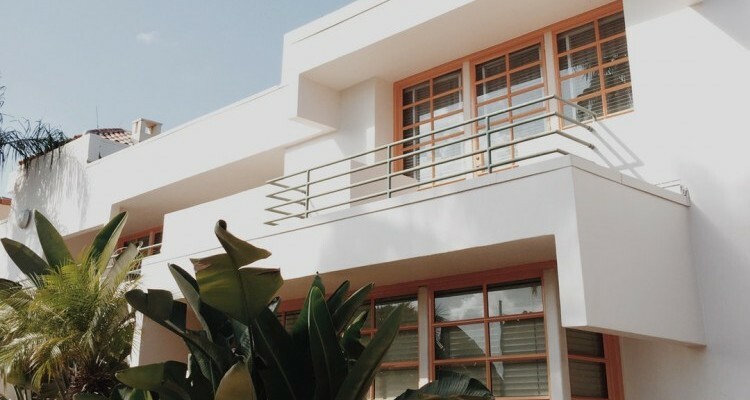 Do you have negative spaces on your site? Do you try boosting your site’s usability for mobile researchers? A negative space is really awesome for mobile pages. Putting the social share icons in the main, left or right sidebar will help you receive hundreds of social shares and values to your site content from day to day. Some plugins may not allow you to put the social share icons in the left or right sidebar. In this case, you may place these icons at the bottom of every post. Now that your website is fully optimized for mobile searches, it’s high time you moved your blogging game to the next game. In this particular lesson, I’m going to analyze the top SEO tips and working tactics. And you will find these helpful. Do you know that your mobile Click-through-rate is a great ranking signal in Google? If it’s constantly detected that searchers do not click on your page URL in search results, Google will rank you down and this bounces back on site traffic. 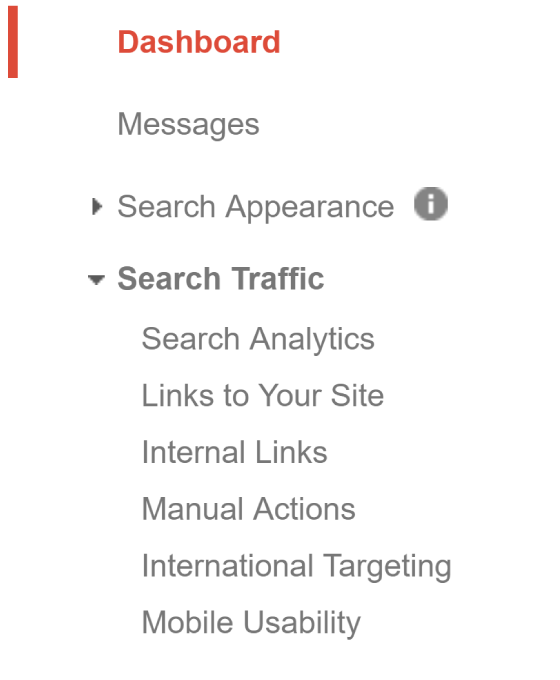 To maximize your mobile organic click-through-rate, click on “Search Analytics” in Google Search Console. 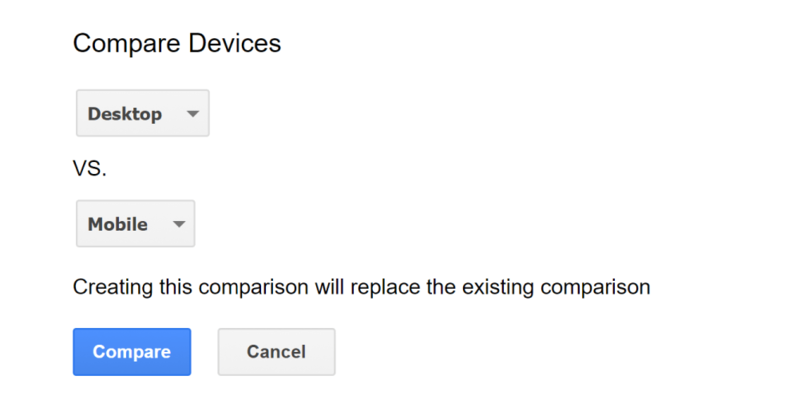 Now, select the “Compare Devices” tab as shown below. Click on the “Compare” button after selecting “Desktop vs Mobile” in the navigation bar. Upon getting results, you may find that your desktop and mobile click-through-rates are somehow different, yet there is no cause for alarm. This is still a normal result. The GSC analysis will further give you suggestions on how you can augment your mobile organic click-through-rates. Going by the Mobile-Friendly update, what matters most to Google as far as ranking your site is concerned? Is it your site’s desktop page speed or mobile page speed? The mobile page speed of your site is more important. 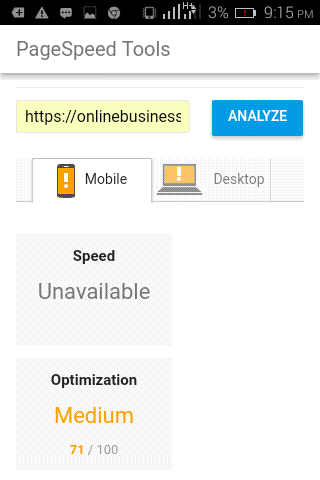 Your site must load as fast as possible on mobile devices. 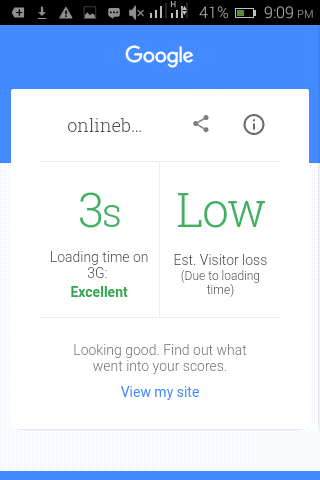 To enhance the mobile loading speed of your site, you must conduct a test using the TestWithGoogle.com. Using this tool, you’re going to get a full report telling you the length of time it takes your page to load on mobile devices. 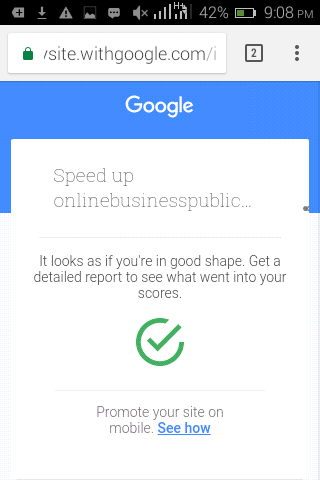 Google will tell you about your site mobile page loading speed status as to whether you’re in good shape or not. If it says you’re in good shape, then you will rank to the first page this 2018. You will get further instructions on what to do to fix the errors responsible for the poor page loading status of your site. Compress Your Images: The EWWW image optimizer plugin is highly recommended if you are a WordPress user. A good example is the 100% free image smusher plugin designed by the superteam at WPMU DEV. This incredibly compresses, resizes and optimizes all of your images for a faster loading speed. 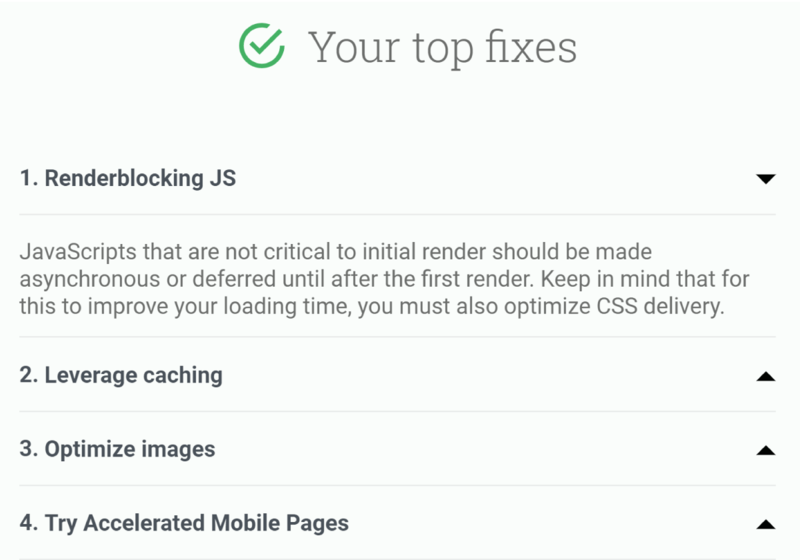 Enhance CDNs: CDNs can enhance the loading speed of page elements on your site three times over. Leverage Browser Caching: To enhance the mobile page loading speed of your site, you need to leverage browser caching. Are you aware that Google recently rolled out its “Mobile-First” Update and it’s being implemented for ranking sites this 2018? Is your own site Mobile-Optimized? How are you optimizing your site for mobile SEO? Do you leverage page loading speed testing tools to assess your site? What are your own tips towards strategizing mobile SEO this 2018? If you enjoyed reading this post, share with friends, groups and communities using the Social Media icons below. And don’t forget subscribing to this site to get all of our future updates. Wow you gave me a lot of information here and I learnt a lot. I am going to book mark it so I can go through it and check my own site with all of the tools you have given me. I am fairly certain that my site is mobile responsive because I added the AMP for WordPress plugin which was recommended to me. Still it is worth doing a check every now and again to see if I need to make any improvements. Thanks for stopping by, Karen! It’s great to see that your site is mobile-friendly. Google now places much consideration on this in its search algorithm. If a site is not mobile-optimized as from now on, it would be difficult to get ranked. The following posts might be helpful. Nowadays, mobile SEO is playing a vital role in online marketing. Most people make mistakes while doing SEO. Your blog post titled “Mobile SEO” is mind-blowing. Thanks Israel for the great job! You covered all the points including “Boosting a page”. Thanks for getting back Niraj! Kudos for reading my blog post! Much grateful! Yes, Google recently rolled out its mobile-friendly update popularly called “Mobilegeddon” and it simply based its ranking on mobile optimization, thus making it difficult for sites to rank in Google without being mobile-optimized. Thanks for visiting! Great in-depth article on Mobile SEO. You have showed us the ways to optimize website for mobile viewing. After going through your post, I could optimize my site and now it is working in all devices. I was really losing value for not optimizing my site for mobile devices. Looking forward for many such great write-ups from you. Thanks for stopping by Himbru! It’s great to know that your site is now mobile-optimized after reading my post. Much grateful! Thanks for visiting! Israel17, your article is very eye-opening and what I liked about it was that it was concentrating on an area of SEO that some people tend to ignore, and that is mobile. Question, what do you think of mobile SEO, is it an effective tool or do you think that it is more of a hindrance? Overall, I can say that it is important for people to be able to access other people’s websites on their mobile devices because it gives people that reach especially since technology rules the world. Your article just illustrates the importance of being able to have access to one’s website via mobile SEO; good work. Thanks for dropping by to leave a valuable thought, R.J! Kudos for reading my blog post! Many veteran bloggers have ignored the top mobile SEO tips over the past years and can’t move their sites off the ground. That was the main reason for the giving up and quitting on the part of so many people. The Google Mobile First-Index is now the Google’s main index. So, you must ascertain whether or not, your site is mobile-optimized using the tools in the blog post. Otherwise, you won’t be able to rank this year. Thanks for visiting! This is a really in-depth article on optimizing for mobile SEO and Google’s Mobile-First index. I’ve been using your detailed guide as a checklist to make sure my websites are mobile friendly and have the best chances of getting good search engine rankings. Luckily all my sites are built on responsive designs, so in that regard I’m pretty safe. For me it’s just a manner of some minor tweaks to make sure I get the search engine love. Thanks for visiting my blog, Darren! Kudos for reading my blog post! I equally implement those tips for optimizing mobile SEO on my site as well. It’s great to know that your site is built on responsive deigns and this ensures that your site will rank well in Google and other search engines this year. Thanks for dropping by! You have caught my attention with this post! As an online business owner I have struggled with the complex subject of S.E.O. and am starting to seriously look at this very involved subject. But I can appreciate when I see useful info like this that is put forward in an easy to understand and valuable way ! Thanks for finding my post helpful, Mike! You have done great by deciding to check your site for mobile updates. This is the update popularly called Mobilegeddon and it’s the very update that determines if your site is going to rank this 2018 or not. Thanks for visiting! Wow! There are so many things am yet to learn about google and its ways. Great post! I must say it’s really interesting. In my opinion, I think it’s best to use the responsive design for configuring to avoid unnecessary issues. If you don’t mind my asking, is there any way to make it the other way around. I mean if you work on your site using your mobile, will there be need to make it desktop-friendly? Any idea? Thanks for dropping by to leave a comment, Queen! You have so many tools to leverage within the post that will help you ascertain whether your site is mobile-friendly or not. You can only rank in Google if your site is mobile-optimized. Google is no longer ranking sites based on the desktop index but on its mobile-first index only. Thanks for visiting! Well written article with bags of information so thanks for that. With users approaching nearly 4,000,000,000 who have access to the internet with some sort of device and with mobiles probably near to or overtaking conventional ways to access the net, a major area that we should be looking at but many tend to neglect. Just checked my url and was showing 7s which is sort of OK according to Google but need improving to avoid bounce rates. Thanks for dropping by, Mick! Millions of people from all parts of the world surf the net daily and search for one thing or the other most from their mobile devices. It becomes necessary for you to ascertain that your site is mobile-optimized. The Google’s mobile index has now become the main index. To rank in 2018, you must adjust your site and ensure that it’s mobile-friendly. Thanks for visiting! Thank you so much for this eye-opening post! I wasn’t aware Google recently introduced a mobile-friendly update and is actually taking it seriously. It is every website owner’s dream to get ranked on the first page. After reading your post, I have a lot of things to work on my website to get it mobile-user-friendly. In the future, my aim is to produce quality and helpful content for my site. Thanks for visiting and reading my blog post! Kudos for finding my post informative! Much appreciated! Google actually rolled out its Mobile-First index in 2015 and that is being seriously implemented this year for the ranking of sites. If you want to rank well in Google this 2018, don’t hesitate finding out if your site is mobile-friendly or not using the tools in the post. Thanks for visiting! Hi, Israel. Very nice chapter regarding mobile SEO. I want to ask you one thing dear do colors of the blog work on increasing or decreasing bounce rate or on-site time of a visitor, I was having a confusion about this I hope you could solve it. Well thanks, for sharing this article it helped me a lot. Thanks for dropping by, Darleen! Kudos for reading my blog post! Much appreciated! The colors of your blog never impact the bouncing rate of your blog. It only makes your blog look more awesome in the sight of your target audience. What really impacts the bouncing rate of your site depends on how frequent, consistent and persistent you are in building out your content and how effective your SEO activities are. Thanks for visiting! That’s a great post, Israel. I believe you covered everything in your post. Optimizing your site for mobile SEO is a must. Google made that very clear with their recent update. Your tips for boosting usability for mobile users are also very good. Paying attention to the details is essential. Reducing the size of a header image is something a lot of people will think is not very important but it can have a great impact on your site. That’s a really wonderful post about mobile SEO everyone should read. Thanks for your comment, Nikos! Kudos for acknowledging the fact that Google is now ranking sites based on its mobile-first index and sites that couldn’t be searched for via mobile will be penalized. Thanks for finding my post so helpful and insightful! I’ve read that Google was trying to make its search “mobile-first”, I understood what it meant, but I couldn’t grasp all of the implications. Your post has been very enlightening with a lot of insights and tools. I will read and implement all of your suggestions, definitely! My site is mobile optimized and I don’t have much problem with the speed. What I would suggest is, since we should check for mobile-friendly SEO, it would be a great time to reconsider and reflect on the SEO we are using – maybe re-engineer it! Thanks for dropping by to leave a comment, Marios! Kudos for reading my blog post! It’s great to know that your site is mobile-friendly already and that you’re willing to improve on that level using those amazing tools. Thanks for visiting! I have only recently got my site up and running so I haven’t optimised it for mobile or tablet as yet. Using your information in your post I definitely know how to do it now. I will also recommend your site to others who are up and coming affiliate marketers that I have met recently. I think as part of the Wealthy Affiliate community we have at our fingertips one of the best networking bases in the world. Thanks for stopping by to leave a comment! Kudos for reading my blog post! Being rest assured as to whether your site is mobile-optimized or not becomes simple with the tools added in that post. Several tools are added with relevant images to let you know if your site is mobile-friendly or not. Your site gets penalized if it’s not mobile-friendly and site speed is nowhere to talk about. Know that Google’s main index is no longer desktop but now mobile index. So, the earlier you work on that, the better your rankings this 2018! Thanks for visiting! This is a wonderful article on mobile SEO and everything that happens behind. The article has explained in detail all that one needs to know about the importance of optimising our website for mobile devices. 2. Does Google AdSense Auto Ads affect the load speed and hence, the mobile-friendliness of a site? (the auto ads is a wonderful feature but looks slightly overwhelming at times) Thanks for the great article! I have bookmarked this page already. Thanks for reading my blog post, Sukumar! It’s great to see that you read and saw the efficacy of optimizing your site for mobile phones and tablets! Google is ranking sites most based on its “Mobile-First” index and every site that couldn’t be accessed freely and fast by mobile users will be severely penalized. Not at all! The “Fetch as Google” searches must be done only for the homepage of your site and that will be okay for all of your pages on that site. Don’t ever get baffled about the Google auto Ads as this is not the real cause of the slow site speed but the excessive plugins installed and activated on your site. Thanks for visiting! Plenty of valuable information to absorb here. As a newbie, there is so much to learn and I haven’t even heard some of the terms before. Thanks for showing the way. I have bookmarked this and will take one lesson at a time to ensure my site is completely mobile friendly. Now, firstly, l will head to Google Search Console to check on mobile usability. Kudos to you, Sharon, for getting in touch with a valuable thought! You have done the best by considering to put things into practice to ensure that your site is mobile-friendly and suitable for search ranking this 2018! Amazing tools are added across the page to ensure that everybody does a proper Mobile SEO assessment. Once your site is confirmed mobile-optimized and the site speed is very okay, then prepare for better rankings, guaranteed. Thanks for visiting! Awesome!!! Now this is a site that is extremely helpful. I put your site on my desktop so I can go back to it, if and when I need assistance in this area. Your site offers information I’m sure a lot of WA members need. Especially for the newbies your site can offer a lot of insight. The layout of your site is easy to navigate which means its organized very well. Kudos to you for creating a site that I’m sure will prove to be very useful! You created a great tool. I’m grateful to you for creating a site that is directly related to WA and what we all are trying to achieve. Great job!! Thanks for dropping by to say a few words in comments, Shoshanah Howell! Kudos for finding my blog post extremely useful and helpful! Yeah, hundreds of thousands of the WA members would make horrific blogging mistakes if they can’t just implement this working strategy. Thanks for visiting! Never thought about the necessity to be sure that my site is mobile friendly. I think it is but I will have to make sure. Thanks for stopping by and leaving a valuable thought, Jo! Kudos for deciding to read my post 2-3 times for proper digesting! You will do well by doing just that, I mean every word. Google has gone fully mobile with effect from now and has decided to rank sites based on its “Mobile-First” update. If your site is not mobile-friendly, you won’t be getting ranked. The mobile index has now become the main index, not desktop index any longer. Leverage all the tools in this blog post and ensure that your site is mobile-optimized. Thanks for visiting! Wish you breakthroughs!